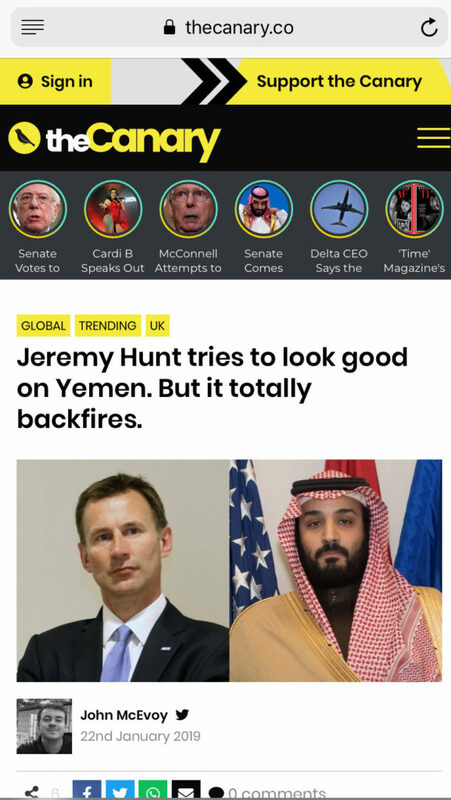 An example of a spin article on the Canary: there is no evidence that Hunt’s effort “backfired”. The article just contains criticism of it. Earlier today I had a conversation with a friend on Twitter who said that some people believe everything the Tory press spews out about the Labour party and its leadership. Both of us have similar views on Corbyn and Brexit, i.e. that Brexit is a bad thing and that Corbyn isn’t effective enough in opposing it. I observed that a lot of my left-wing friends on Twitter are just as addicted to and credulous to material on pro-Corbyn ‘spinsites’ such as Skwawkbox and The Canary as others are to the Tory press. I have known some of them since the early period of the Coalition austerity period when the grassroots or ‘netroots’ opposition came together to fight “the cuts”, as we called them, particularly to the disability benefit system, but a lot of them seem to have lost their sense of reason since. Quite simply, anything anyone says that is unflattering to Jeremy Corbyn must be a product of Tory propaganda or brainwashing. Generally speaking I don’t follow links to those two sites anymore. Most of the content is basically pro-Corbyn spin. The links very often claim that a very dramatic revelation has happened or that Corbyn or an ally has ‘destroyed’ the government or a particular Tory policy. However, all that the story says is that someone has criticised it in Parliament. Very often the content is just an opinion or a particular interpretation of something that has been said, not a revelation at all. 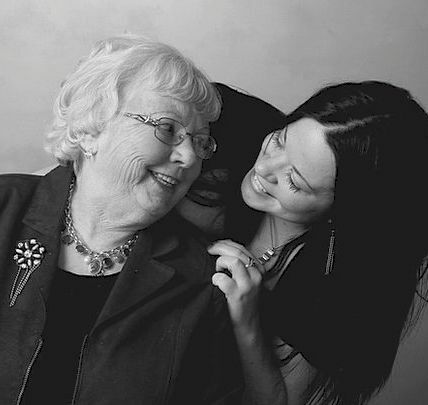 It reminds me of the times when Norman Lamont and later Ann Widdecombe, both cabinet ministers under John Major in the 1990s, made speeches that were much ballyhooed in the press as being enormously significant and revelatory, but when we heard them, they were just moans. This has become par for the course with links from pro-Corbyn Twitter accounts, usually with “#GTTO” (Get the Tories Out) in the tweeter’s name. #Labour will provide young people with free tuition, apprenticeships, free bus passes to get to college/work and £10 an hour minimum wage. In addition, Labour will increase renters’ and workers’ rights and will build one million new homes which will all help young people. You may have noticed which option is missing. I don’t follow this guy. 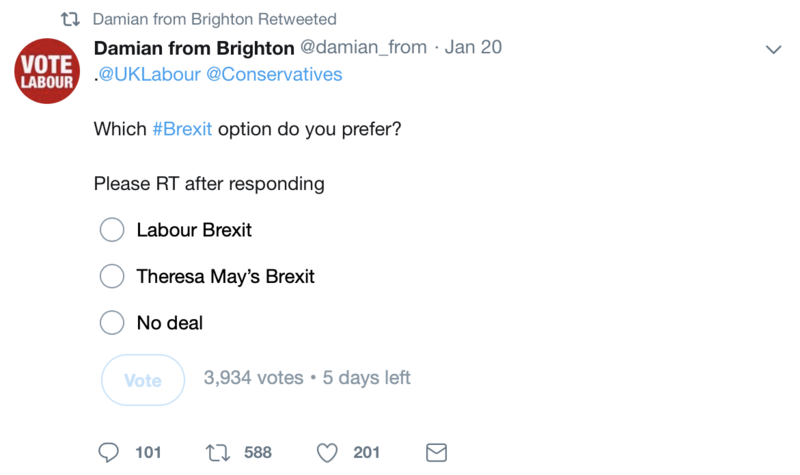 But one of the Corbynites I follow (and have been following since probably before Corbyn was elected, and certainly before Brexit became a big issue) retweeted him into my timeline which is how I saw this. However, Damian sounds a lot like a Tory with his boasting about “respecting the referendum result”; the referendum was 2½ years ago, and if there is no objection to another general election on the same grounds, there should be no objection to a further referendum now that facts are known that were not known in June 2016. General elections are legally now supposed to happen only once every five years; if Brexit goes ahead this March, with or (as now looks increasingly likely) without a deal, reversing it if necessary will take a lot longer than five years as there will be opposition to us rejoining quickly. And there is a reason why some of us believe Brexit should not happen, regardless of the (narrow) victory in the 2016 referendum for leaving, which is that it will plunge the country into economic isolation which will be a disaster for the businesses that employ the majority of people; it will also narrow the horizons of Britain’s young people who will lose the right travel freely in Europe; it will hugely impact families in which either spouse is from another EU country, and it will make it extremely difficult to build new ones, as they will all be subject to the same onerous rules as have affected non-EU spouses since Theresa May’s days as home secretary. A depressed economy occasioned by no deal or a bad deal will make it a lot easier for today’s micro-factions and hooligan mini-armies of the Far Right to recruit new members, as I have previously explained. The complaints of Leave voters in traditional Labour constituencies can be addressed in other ways than leaving the European Union. The Labour Party’s current appearance of success depends on its large membership and on attracting the votes of young people, particularly students. This vote will be dissipated if Labour contests a general election on a platform of “respecting the referendum”. History shows that Labour cannot win elections by appealing only to its core vote, and more than 48% of the electorate in any case should not be treated as an unrepresentative, out-of-touch elite — that’s a greater share of the popular vote than Thatcher or Blair ever got.